May be a stretch, but what if this isn’t about the wall or immigration, and instead related to the 70,887 sealed indictments? Another interesting coincidence related to this? This letter was found in this article. Take note to the title of this article. Where have we heard “dark to light” before? First off, he is not a threat. He only has 4,000 followers on Twitter, and only gets an average 150-250 plays per YouTube video he puts out. In the big scheme of things, he barely makes any impact at all. But why does he spend so much time hating on #Qanon and the anons following Q? It’s quite simple really, it’s a tactic called “rage trolling”. This is one of the biggest tactics being used right now by the deep state. The White House has declared for the first time today that the US Army will be the main contractor building the southern border wall, the Daily Mail reported today. This is something that we anons, or #Qanon followers, have known about for months now. This was always the plan. Kevin Spacey has appeared before a judge today for the first time to face charges of sexual assault. Spacey, 59, is accused of groping an 18-year-old employee of the Club Car, a restaurant and bar on the island of Nantucket, in the evening of July 7, 2016. He stated, in court documents before trial, that he would plead not guilty. But in the courtroom itself on Monday he did not speak, and was not asked to enter a plea. He appeared to think his arraignment today was VERY FUNNY. Very odd. 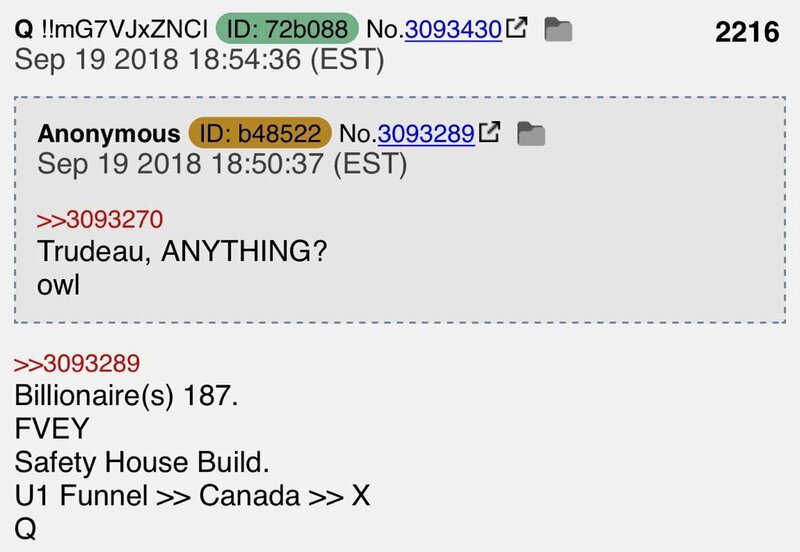 1/ thread - Deciphering the #QAnon Trudeau drop. Found dead in their home. Conveniently, the murder ended a probe into their fundraising activities on behalf of the Liberal party.
! !NEW Q!! 16:55 CDT Attention on deck!!
! !NEW Q!! 16:56 CDT Q replies to Anon and says that Anons picked up on the 'carpet' bombs. For you and you alone! 1) This is my #Qanon update for posts by Q between March 21 and the present. 2) After another bomb was detonated on Tuesday in Austin, Texas, #Qanon posted this, noting that the FBI had opened an investigation to see if his "Boom" statements were related to the exploding packages. 3) #Qanon said the "investigation" was a (deep state) attempt to disrupt his communications and that the plan would fail. He said the real story on the bombings would be released Wednesday. (1) Today POTUS will meet MbS crown Prince of Saudi Arabia. Here's why I think this is a big deal. (2) If you wanna understand how important this alliance is to #TheStorm, just look at this picture.